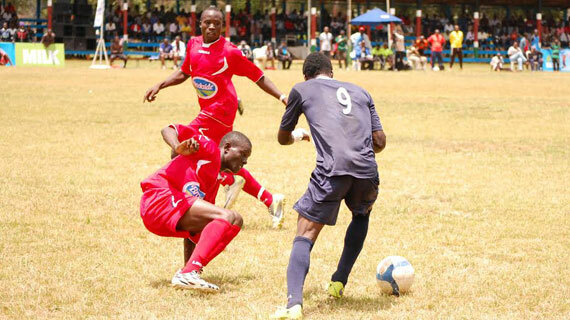 Bukembe High School boys soccer garnered its first win at the ongoing East Africa Games in Eldoret on Tuesday. The Nzoia regional champions beat St.Basile of Rwanda 3-1 in their second match at Hill School after drawing 1-1 with St.Mary's Kitende of Uganda on Monday. Pascal Niyonguru opened the floodgates in the 19th minute leading 1-0 but their joy never lasted as Wycliffe Wanyonyi of Bukembe equalized in the 35th minute after connecting a pass from Patrick Otieno. The half time ended 1-1 and the Kenyan side came in the second half a better side dominating the game. Otieno then added the second in the 46th minute before he grabbed his second and the third for the Bukembe boys in the 70th minute for the win. Bukembe coach David Kalam was very delighted by the win despite being pitted against tough teams in the pool, "It was a tough game but we expected a win since we had strategized for it after we drew yesterday. Our target is to be in the final," He said. In other matches, Kibuli of Uganda drew nil nil with Hanika TSS of Rwanda while St.Mary's Kitende won 3-0 against College Gisenye of Burundi. National girls football champions St.John's Kaloleni beat Alliance of Tanzania 3-0 in their second match. In the boys volleyball, despite exhibiting a spirited fight ,national champions Cheptil failed to capitalize on home advantage in their second match against defending champions Rusumo of Rwanda. Rusumo won 3-2 (25-17, 26-28,25-23,21-25,15-13) in the five set thriller while Lycee Denyanza beat Luyanzi 3-2 sets. In the rugby 15 aside, national champions Bungoma beat Makerere 28-0.